Music for Maniacs: BROWN-SKINNED MORMONS A-GO-GO!! BYU had this group touring, put out three albums, at least. 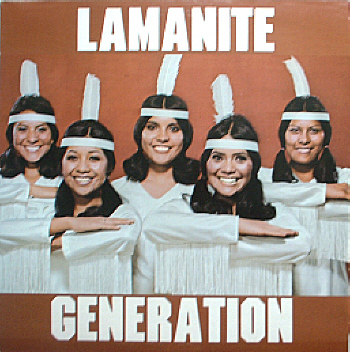 They've largely disbanded and repudiated the Lamanite (American Indian and Pacific Islanders, descended from the lost tribe of Israel) histories, ever since the DNA evidence didn't corroborate that the AmInds were semitic in origin, and changed the Book of Mormon editions about the Hebrew origin of the Americas in 2007.